“I’m what they call ‘stubborn.’” Gloria flashes a wry smile, but it’s not hard to see that the memories still bother her. 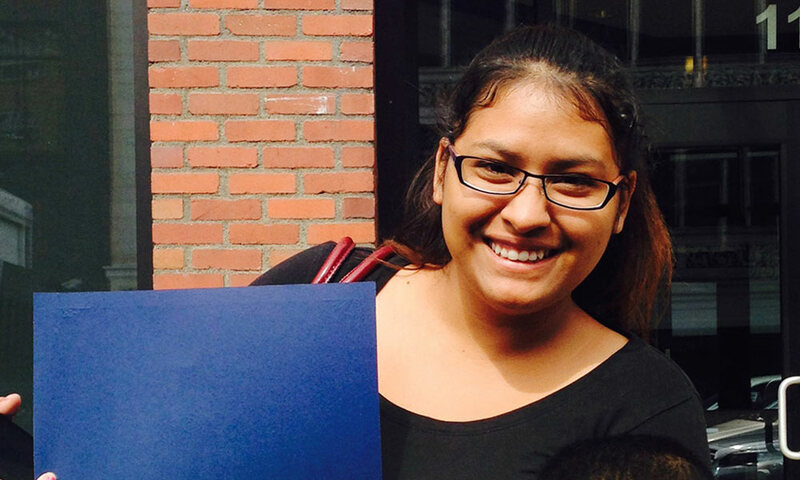 “I was constantly being told, ‘Just take your GED. It’s a lot easier for teen moms. It’s what’s convenient.’” But Gloria had wanted to graduate from high school since she was a little girl. And she was tired of being told what to do. We hear this a lot from Bridging the Gap youth, who come to us from foster care. Young people in “the system” feel a lack of control over their own destinies. Between caseworkers, attorneys, judges, and foster parents, there is no shortage of well-meaning adults deciding what is best for a young person—often with too little input from the young person whose life is affected. So Gloria’s insistence on a high school diploma was about far more than that piece of paper. “Sometimes, when you feel like you don’t have any control in your life, you have to get a hold of the very few dreams you do have and make sure you don’t let them go,” she said. “School was one of the biggest things that I held onto.” Gloria’s son was in the audience as she walked across the stage at graduation. Mile High United Way’s Bridging the Gap came into Gloria’s life when foster care ended. Unlike foster care, she says, in Bridging the Gap “you start off with full trust.” Gloria is in control—we are simply there to provide her with coaching and support when she needs it.